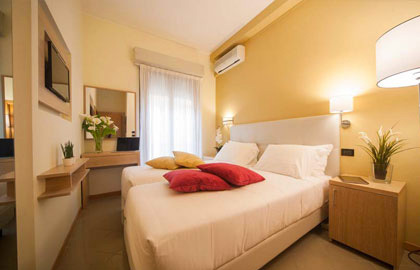 All the hotel rooms have just been renovated and equipped with an independent climate, balcony, LCD color TV and a safe. All the bathrooms in the hotel have been completely renovated with a shower cubicle, hairdryer and courtesy kit. The Ostuni Hotel in Viserbella now has two different types of rooms, COMFORT and SUPERIOR, to ensure that each of you can find the formula and treatment that best suits your needs. These rooms ensure superior comfort and services at a favorable price. They are our simplest rooms. 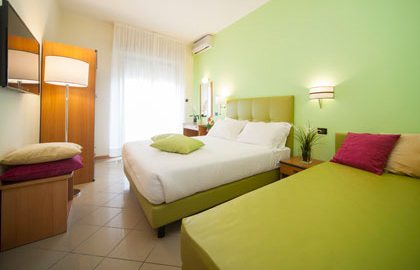 They offer new and very comfortable sommier beds, new lighting, LED TV, air conditioning and free wi-fi. They are our best rooms, equipped with all modern comforts. SEA VIEW with balcony, are our best rooms, completely renovated furnished with care and originality, equipped with all modern comforts. In addition to all the services of the Comfort rooms, they have a mini-bar, a comfortable coffee maker, a large LED TV, a personalized courtesy set, and soft bathrobes on request!